When you begin the process of putting a Lower Montessori Elementary Classroom (6-9 years) in place, it is critical to consider the size of class and number of children in the classroom to determine how their work flow will be accommodated. The growing body of the elementary child is much like the infant child. He is changing fast and he has a serious need to move and socialize just when we are usually requiring him to sit still. For this reason, if you have an opportunity to create a new classroom from the beginning, select a large room for the elementary age children. 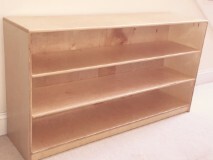 In a Montessori classroom the children will be working in groups on many display projects that dictate space so GO Big. Desks are not as practical as large tables and chairs in these classrooms. Large tables allow for group activities and sharing of ideas. For this reason, we recommend that you consider our large rectangle,round or square tables and chairs. If your space is small, some of these can go against the wall. Our consultants can help you with planning within your space limits. Often these programs have to adapt to smaller classes than needed. For that reason, Montessori Woods recommends that you consider as many vertical material wall shelves as you can fit. Go with five shelf units instead of three or four. You also may want to consider some tall book cases for the language section of the classroom.Elementary age children are taller and can reach higher, so consider vertical space that can be used. We are now offering a package classroom for new programs or programs wanting to expand. These packages are offered at a 50% discount. 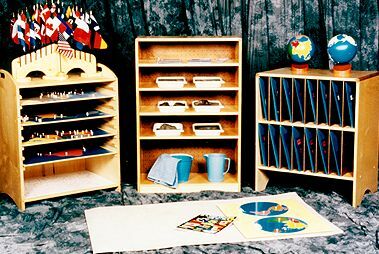 The right furniture is critical to a Montessori Elementary Classroom. If you need Geography Specialty Furniture or other specials look below and click on our Specialty Page.